India is a truly incredible country that I instantly fell in love with when I first visited back in 2006. With a population now estimated at 1.3 billion people, visiting is always an interesting experience and it’s a melting pot of ethnicities and religions too. The dialect can change as often as the days of the week as you travel. Every day is an assault on the senses – the smells, the colour, the sights and the people of India stick with you forever. For some, it’s all too much and the ‘culture shock’ can take it’s toll. 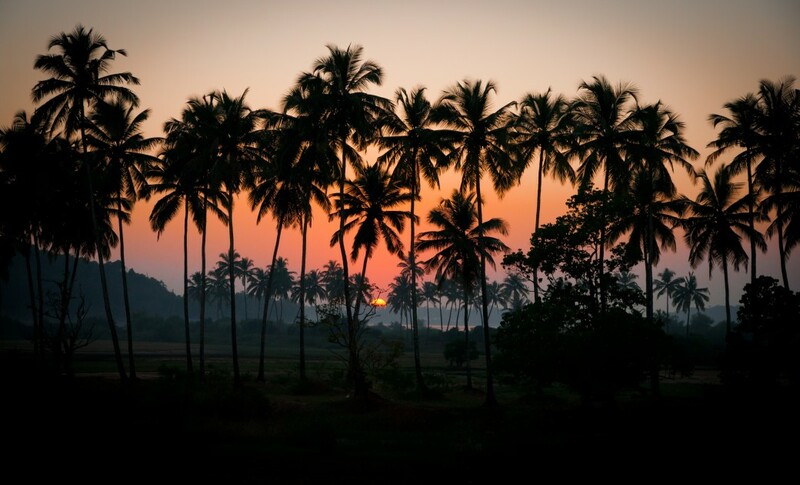 Personally speaking, India has given me some of the most humbling, exhilarating and rewarding travel experiences. I have made three extended trips to India in the last ten years. The appeal of salt-water fishing in India to me is the vastness of the country and the relative absence of other sport fishermen. There is so much ground to cover and it’s a rare occurrence to find others fishing. Essentially, it feels like you have the whole place to yourself, especially so if you’re prepared to get off the beaten track a little. It’s a veritable ‘fisherman’s paradise’ with plenty to satisfy the pioneering angler. Not to say the fishing is easy or on a plate, you must be prepared to work at it. But for those with a sense of adventure and willing to make the effort then the results are certainly there for the taking. The majority of locals you meet fishing usually do so with a throw net or simple hand-line. My first trip was by pure chance as I had a friend that was hanging out in Goa over the winter and he had stumbled upon some good fishing. 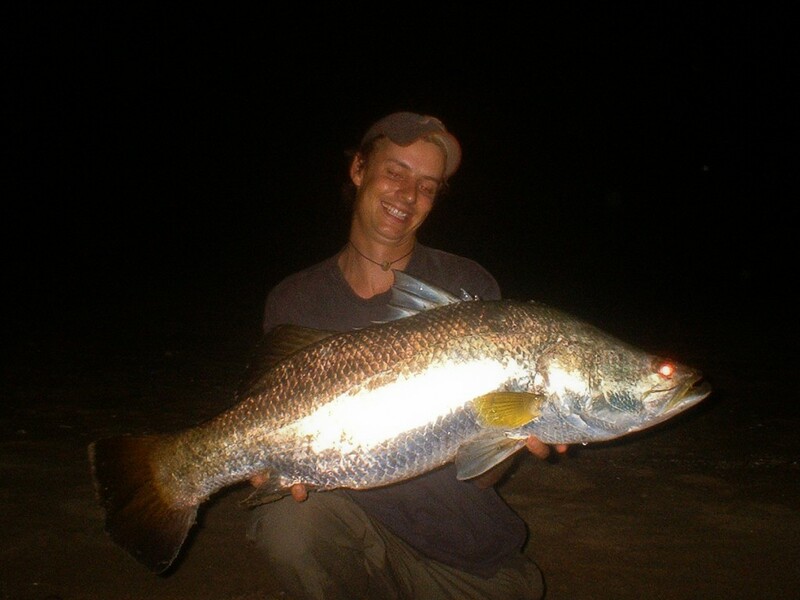 Scott, an old university friend, had sent me a few photos of some reasonable Barramundi that he had been catching after a tip off from a few local guys. This was all the encouragement I needed and it wasn’t long before my flight was booked, my bag was packed and I was off. This was back in February of 2006 and I was at a crossroads in my life right then…..I had nothing to lose. The thing about India is that if you are careful it is possible to live very cheaply and this makes the prospect of an extended trip a viability. Then there’s the weather which is pretty much wall to wall sunshine from November through to March. It’s a perfect winter get-away for when the never-ending gales and rain lash our shores. My first trip was for 6 weeks and I have to admit I was a little nervous as I boarded the Virgin Atlantic flight alone – I had no idea what to expect at the other end. Travel guides are great and help a little but nothing had quite prepared me for the chaos that is Mumbai. I will never forget the madness of first getting through customs and out in to the arrivals hall, being confronted by a sea of faces all trying to relieve me of my bags and rod-tube, offer me taxi services, rooms to rent, black market currency exchange. It was all quite overwhelming and as I made my way through the thronging masses towards the door I was fortunately greeted by Scott’s smiling face. He had a rickshaw waiting for us and we jumped straight in, heading to the Colaba District at breakneck speed. With the latest Hindi pop music blaring out at ear bleeding volume and the insane traffic, it was quite a ride! 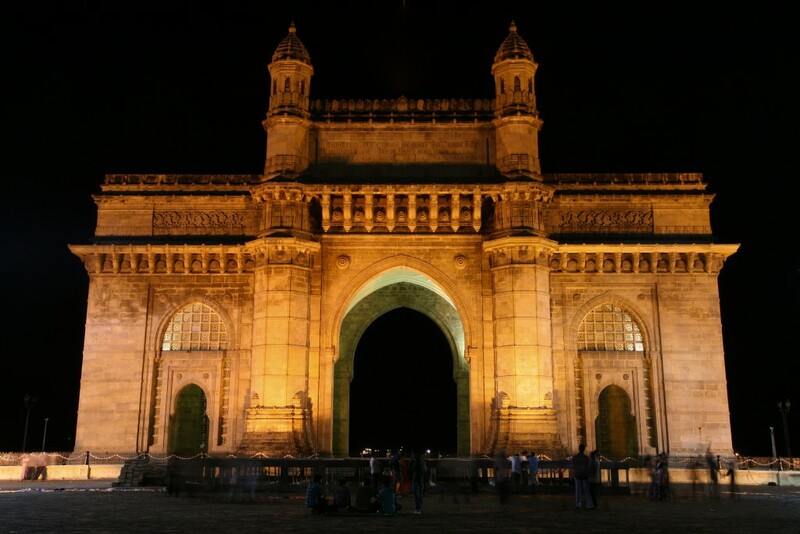 One night was spent in Mumbai and we zipped all around the city taking in the sights and sampling the culinary delights on offer before heading down to Goa on the train the next day. Once in Goa then the fishing could begin in earnest. During the journey, Scott entertained me with tales of the Barramundi fishing and explained that there was also the chance of catching mangrove jacks, barracudas, grouper and trevally species. The tackle I had with me on this first trip was a heavy duty 5-piece travel spinning rod, a load of lures and a few odds and sods of tackle for a bit of light bait fishing. I really had no idea what to expect but the main focus would be fishing for the Barramundi, hence the lures. These fish really do pull your string, coupled with their reputation for searing runs and acrobatics it makes them a sport fish par excellence in my opinion. I was very excited at the prospect of coming into contact with my first Barra! Our plan was to target them at night, fishing on the estuaries right at the mouth. We planned to ambush the fish as they enter the river systems on a rising tide under the cover of darkness, on the look out for a feed. The rivers that run down to the sea on the West coast are largely untouched by the hand of man and often there were huge sand bars across the mouth formed by the tides and current. These were the ideal spot from which to cast our lures and intercept these fine, sporting fish. The first nights fishing was a baptism of fire for me. After a bumpy twenty minute cab journey from our lodgings we parked up next to a chain ferry on a large estuary system. With the moon being quite bright it was possible to see up the river and at the head of it was the mouth with a large sandbar running partially across it. We made our way towards it wandering up the beach beside the river and took position around the sand-spit. I chose to fish with small rubber shads as I had plenty of them. 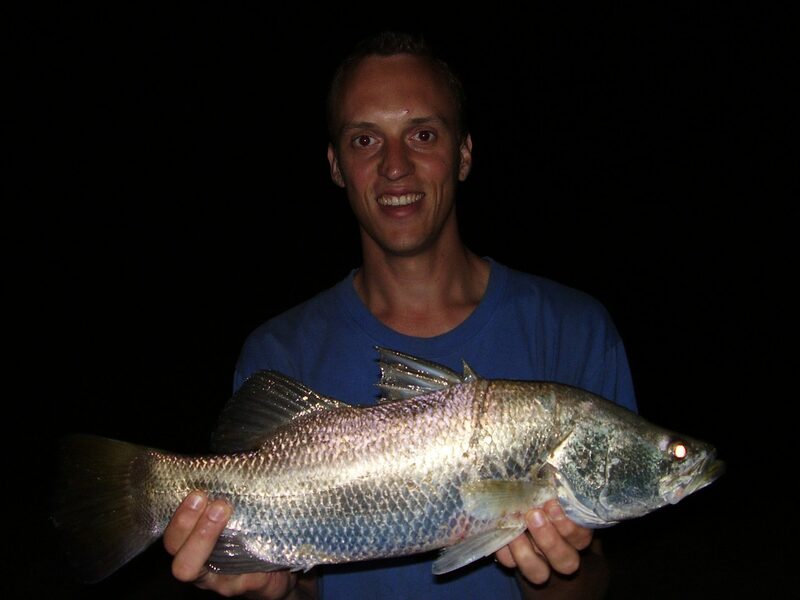 After checking all the knots and the reel settings, I finally made my first cast into the barramundi infested waters. After all the weeks of preparation and thousands of miles travelled, it felt great to actually be there knowing that at any moment there was a chance my lure could be nailed by one of these legendary monsters. The current was rushing round the head of the spit and in the moonlight it was clear to see where the lines and back eddies were. It was possible to swing the lure across and down the current allowing it come round into the back eddy and then fish it through the slower, swirling water back to your feet. It didn’t take long until I got my first hit. This was a feisty mangrove jack that put up a spirited fight but gave me no real problems. I was off the mark and beaming from ear to ear. I went on to catch a couple more of these snapper all around the same size and kept one for the pot, to be curried up and baked in the tandoor oven the next day. Scott and Ashok (our local fishing buddy) were busy fishing next to me and they were also catching the occasional snapper until all hell broke loose at Ashoks end. He was screaming ‘Barramundi’ and was running along the shore trying to keep up with the unseen beast that had snatched his hard bodied lure right at his feet, making a dash for it. I reeled in and wandered up to check out the action. I was treated to the sight of a large barramundi repeatedly tail-walking and leaping in the moonlight, spray flying into the air as the fish shook it’s head trying to rid itself of the hooks. It then took off on several fast, clutch screaming runs before a little more tail-walking. This started to tire the fish and it was hanging deep in the eddy, plodding around for a while before Scott was able to slide it up the beach. It was a beauty, probably close to 20lbs in weight and absolutely pristine. My appetite was now suitably whetted. Having seen one of these magical creatures in the flesh I simply had to catch one of my own. It wasn’t going to be easy though. A couple of more sessions proved fruitless for me and I had to make do watching some really special fish come ashore to Scott and the two other local guys we were fishing with. At least I knew we were on the money, surely it would just be a matter of time before I struck gold? A change of venue to a much smaller river saw me get my first experience with the Barramundi. It was a fair hike along a good mile of pristine white, sandy beach until we reached the river that night. It snaked across the sand in a big ‘S’ shape before meeting the incoming rollers at the mouth. The sand bar was not so pronounced here but there was a lovely bit of deeper, steady water behind it that just screamed fish! 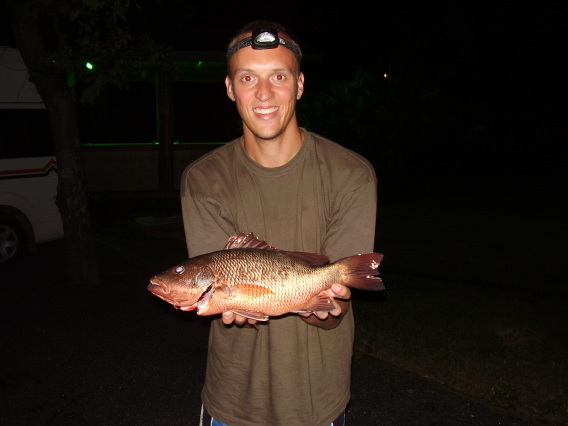 I was casting a small 4 inch rubber shad that night, hopping it across the bottom through the deeper channel when the rod bucked in my hands and a fish was on. It tore about a bit and made a couple of leaps before being quickly subdued, unhooked, photographed and returned. It wasn’t the epic battle that I craved but I was off the mark with the Barramundi. This experience just made me all the more determined to find my own trophy fish. The next few weeks were spent travelling around by train doing the tourist thing and indulging in some freshwater fishing (but that’s another story – Part 2 perhaps?). I wanted to have a good look around whilst in India as it was my first visit so I made the journey down South to Kerala exploring the back waters round there. I then made the epic journey up North with Scott and we visited the Taj Mahal at Agra and spent some time in the crazy, medieval city of Varanasi. It was an incredible experience and gave me a real insight into life in India. Varanasi blew my mind, it was fantastic. For the last week of my trip we were back in Goa, but this time managed to find ourselves some very basic huts right on the banks of our favourite estuary. 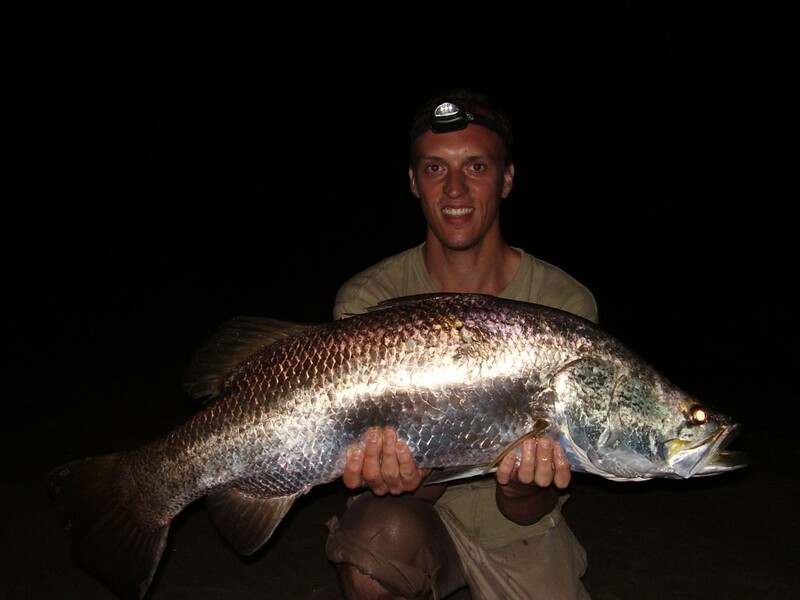 We were quite literally on the water and went nocturnal in our bid to catch these Barramundi. We would rest lazily in our hammocks during the day when it was too hot to fish, emerging only at dusk to fill our bellies and then head up to the mouth to begin casting. We knew the fish were there and had to pass in front of us, we just had to be there casting our lures when they did. The fishing proved tricky with only one decent Barramundi falling to Scott’s rod over several days. We worked hard at it, casting repeatedly over and over, ringing the changes, mixing up the retrieves, swapping the lures. You name it we tried it. On my penultimate night, I was fishing a large rubber swimbait when I got the mother of all hits. My rod smashed over and line was tearing off the reel with the clutch singing in protest. The fish was heading for the horizon on a blistering run when the line just fell limp and it was gone. I was gutted. I felt hollow. I think we can all relate to the empty feeling experienced when you lose a massive fish. I never even got to see it either which always make it worse in the mind. All I had as a souvenir was a destroyed lure, the rubber torn to bits and one point of a treble straightened out. Being so close to going home, I was beginning to think I wasn’t going to get my moment. I tried to push the negative thoughts to the back of my mind and hurried about getting another suitable lure tied on to a fresh leader. After all, there were clearly some good fish around that night, my lost monster was testament to that. But were there any more? I got back in to the rhythm of casting and searching the water with my rubber lure, this one with just one strong single hook. I reasoned that having just one hook may prevent the fish from getting any leverage if I was fortunate enough to hook another. I was busy working my lure around the faster water when I got my second bite at the cherry. The rod just heaved over in one fluid motion and stayed there. This was my chance, quite possibly the last one too, my nerves were shot to pieces and I was willing the fish to stay attached. I backed off the drag slightly and let it go, the clutch purred away as the fish tore off into the darkness making the most unbelievable run. Then it went airborne and gave me a fantastic display in the moonlight, shaking it’s head angrily and slapping the surface with it’s tail as it thrashed about. 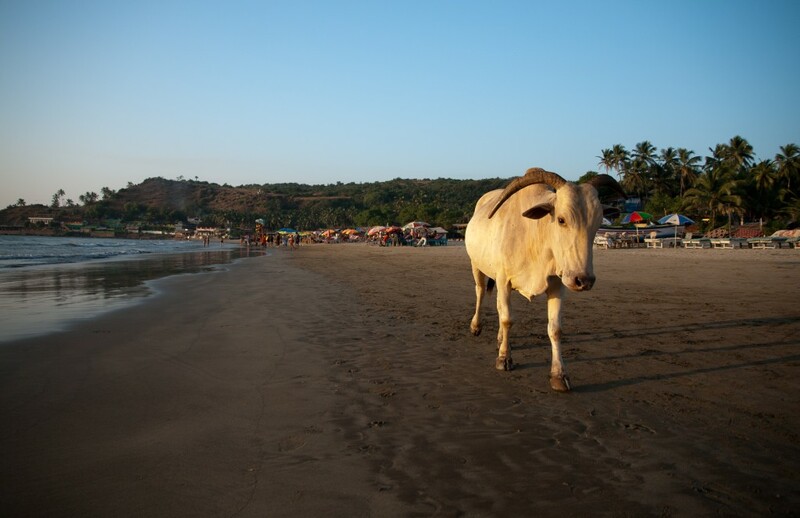 It just kept on going and I steadily followed it along the beach, it was a truly exhilarating experience being connected to such a powerful, wild creature. I was fully in the zone and enjoying every sweet second of it. The fish started to tire after a couple of more minutes and I was able to start pumping it back towards me. Losing this fish was not an option, it would have been simply too much to bear. After a few more short runs, the fish neared shallower water and we got our first proper glimpse of it up close. It was a beauty. I was ecstatic and the blank sessions and aching muscle were immediately forgotten about, this is what I had travelled all those miles for. Beaching the fish is often when many are lost through being caught in the undertow, I had to take care with this one. Fortunately, Scott leapt into the water and was able to pick the fish out as it wallowed in the edge. I let out a huge cheer. I was buzzing and to have finally achieved the goal after all the travelling and effort was an amazing feeling. It went 19lbs on the scales and after a few quick photos was released. That was me done and just in the nick of time too. I sat back and relaxed after that, watching the others fish on. I no longer felt the need to cast, I was satisfied. No more fish were caught that night and this brought my first Indian adventure to an end. We were quite limited to how we got around on this trip, always having to rely on buses, trains and taxis doesn’t make things easy. I returned to India several years later in 2010 with Scott and we hired a couple of scooters. We did over 5000 km’s on these, camping as we went. It changed everything, giving us far more independence and mobility. Our fishing improved dramatically as we were able to target so many other species and marks with some incredible results and some spectacular catches. There is also the Mahseer fishing we discovered on the Upper Cauvery river which blew our minds. The fishing in India has always amazed me, there is so much potential and yet so little is known about it….. But that’s something for ‘Part 2’……until the next time……..TIGHT LINES! I have a facebook page which can be see by clicking on the link below….if you’d like to keep up to date with all my angling antics and current fishing then don’t forget to ‘LIKE’ the page…Cheers!